An angel trapped in telephone wires. At the Church of the Holy Trinity Marylebone, Paul Fryer replicates the heavens and earth to demonstrate man´s megalomaniacal folly. For `Let there be More Light,´ which runs during the Frieze fair a few steps from the main tent, the acclaimed English artist collaborated with engineer/physicist Colin Dancer to produce a meticulous representation of natural starlight, cosmic rays, electromagnetic forces and sound waves that Fryer brings into being with the flick of a switch. But Fryer doesn't stop at playing God with wires and electricity. 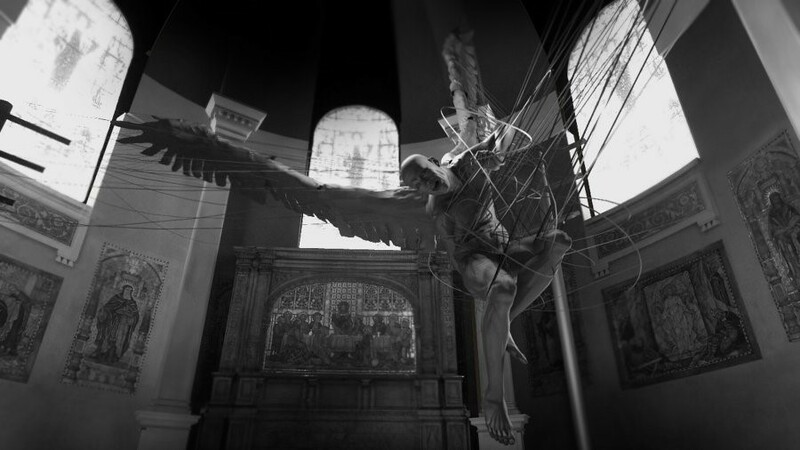 He also displays the consequences of man´s hubris with a figure of a child-sized angel trapped in telegraph wires, recalling his 2007 ´Martyr´ installation, where he depicted the accidental death of a lineman from falling onto wires as modern-day image of Icarus. The crowds at Frieze may be searching for the next art star, but Fryer wants his creation to illuminate a higher set of concerns. The exhibition continues at Dickinson, 58 Jermyn Street, London SW1 10am – 5pm until 31 October.